In strength and conditioning, we can all be found guilty of over complicating our programming from time to time. With the vast array of options available to us it’s hard not to get overwhelmed with what is right for us and our goals. The sandbag is proudly low-tech but high on results. And when you see what it can do for you it may just become your new favorite training method. Sandbag training has undoubtedly been around for a long time, but it’s perhaps only in the past century when it has been recognized as a legitimate form of strength and conditioning. There are certainly numerous records of the sandbag being used for structured training as far back as the 1890’s, most notably by Indian Wrestlers. They continue to be used by combat athletes today but more and more people, irrespective of any sport specific benefits, are recognizing the sandbag as a serious strength and conditioning tool. I have only been training with sandbags for 3 years or so and they have transformed the way that I approach my programming. I train exclusively with the Brute Force Sandbag but it’s entirely possible to develop your sandbag training program with a homemade bag. The important message here is that you needn’t let your budget dictate your potential results. As a strength coach, this is one of the reasons that I am so passionate about sandbag training – anyone can start right now with the very minimum of investment. I started with an old duffel bag and 100lbs of sand that cost me less than $5. Sandbags are tough to work with. While you can certainly develop a more efficient lifting style with practice, the sandbag will always punish poor technique. It’s awkward and has a constantly shifting load – this adds up to a serious challenge, even for advanced lifters. The sandbag is a real life object. It can be used as a representation of another person – this is perfect for anyone involved in contact sports and those in the armed forces, police, firefighters and many more occupations. You cannot lift a sandbag without working your grip. In fact, this is what many new trainees notice first. Any sandbag workout is also a grip workout. This further adds to the functional nature of the sandbag as a training tool. Training with sandbags develops mental conditioning as well as physical strength. There are few tools that can break an athlete as quickly as a sandbag. In fact, just getting the sandbag into position or transitioning between exercises is a challenge in itself. This builds serious mental toughness. It’s important to develop strength and competency throughout all three movement planes (sagittal, frontal and transverse). This is an important facet of training for sports and daily life but also as a means to prevent injury and maintain general structural health. Besides movement in these planes of motion, it’s also important to consider the practice of “stressing” these planes. The sandbag and its permanently off-centre load automatically stresses the body in a true multi-planar fashion. Strong legs, shoulders and backs are an unavoidable result of sandbag lifting. It is possible to develop an efficient sandbag lifting style but it will never be an olympic or power lift. The sandbag just won’t allow you to apply the same biomechanical principles. When things start getting tough you’re going to need to dig in and work hard. Lifting a constantly moving object like the sandbag requires and develops your stabilizing muscles like few other things. You simply cannot underestimate the balance and control required to lift a heavy sandbag overhead. Regular sandbag lifting builds a strong, stable musculoskeletal system. Like most training tools, you can use the sandbag as a substitute weight for traditional resistance options like barbells, dumbbells or kettlebells. You can follow standard strength programs like Starting Strength or Wendler 5-3-1 with a sandbag. 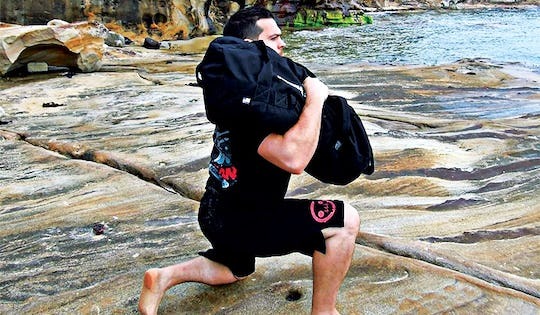 The sandbag works perfectly well for Deadlifts, Squats, Cleans and Presses. But if this is all you ever do with your sandbag, then you are missing out on some of the key benefits to this method. The sandbag is an unstable, awkward load with “built in” instability. The further away from your center of gravity that load is, the harder you will have to work to stabilize it. So, exercises like the sandbag deadlift don’t have that inherent instability factor. My advice is to focus more heavily on a range of “unique” sandbag exercises – things that usually aren’t as effective with traditional resistance tools. For me, that means lots of overhead work and utilizing a range of different grip positions. These fundamental movements will give you a strong foundation of strength and conditioning. Furthermore, they all combine some of the best that the sandbag has to offer. Complete as fast as possible. Men aim for a 60 lb sandbag; women should aim for 35 lb. Complete all exercises of the circuit before beginning the next round. Men aim for a 60 lb sandbag; women should aim for 35 lb. A4. Sandbag Shouldering – 3 rounds x 25 reps. This training protocol is inspired by, and named after, Milo of Croton. A Greek wrestler from the 6th century B.C. Take a handless sandbag and fill it with between 25 and 50% bodyweight in sand. Perform a single ground to overhead lift. Repeat this daily, adding 1-2 lbs of sand before each lift. Complete all exercises of the circuit before beginning the next round. Men aim for a 100lb sandbag; women aim for 60lb. A2. Burpees – 10 rounds x 10 reps.
Take a 100 Skip penalty for every rest that you need to take. Men should aim for an 80 lb sandbag; women aim for a 45 lb bag. Men Aim for an 80 lb sandbag; women aim for 45 lbs. The sandbag is an exceptional strength and conditioning tool that, when used effectively, will help you to develop great strength and conditioning. Take a structured approach to its use and include a wide variety of standard lifts (like Deadlifts and Squats) alongside a range of other “unique” lifts like Bear Hug Squats and Shouldering.